So, I was chatting with a reader from the U.K. and I mentioned what I call Mean Rules. He said I should post some. I aim to please! A little background, like I said, some Rules just come to me fully formed and I send them on to you relatively unvarnished, because that’s how my brain works (for example it’s 1:14 AM and I woke up feeling hungry. I thought “you know what would taste good? An orange.” Then I started thinking “when is the last time I ate an orange? It’s been a long time…” Then I thought, “it’s been a long time since I ate a grapefruit too.” And then, the more I thought about it, I realized that I can’t remember the last time I ate any citrus fruit. And you know what? I have been feeling like I have a cold coming on the past few days, maybe in need vitamin C? Then, BOOM, I realized I don’t know the symptoms of scurvy. I know it comes from a lack of vitamin C and I know at least three colloquial names for it-Moeller’s Disease, Barlow’s Scourge and Cheadle’s Complaint-but I have no idea why I know those names! I’m guessing it’s “interpreter knowledge” -see Rule 14- but if I know the names then why don’t I know the symptoms? I could, in fact HAVE scurvy right now, and die from it, while knowing nothing more about the sickness save it be four names for it; three regional monikers, and scurvy. So I got right up and made microwave popcorn. Annnd tangent done. Hi. You may want to go back to the last word before this parenthetical. Remember? It’s a parenthetical, see>) other Rules are only half formed when they arrive and I have to ruminate like a Guernsey cow to make them workable. Some Rules I write as a reaction to what is happening at the moment. Because of this somewhat unpredictable process I often find Rules I’ve written long ago, hidden in files and boxes, preserved on whatever paper I had with me when the humor hit. There are Rules I don’t post for various reasons, for example, some I no longer understand what they mean. Seriously, I wrote them long ago and I read them now and… no idea. They were attached to a specific event I can’t remember and the context is gone. Sometimes… the Rule is just too mean. Funny but mean! But mainly funny. It probably doesn’t matter that your Client might not know when to use ‘less’ and when to use ‘fewer’ in English, because your TEAM absolutely doesn’t. (Written on the back of a parking pass from a hotel dated 2012). Vocabulary will not save you if you refuse to listen or think. The Superintendent told me to rewrite it). Want another one? Same players? While observing [the instructor’s] class I saw that at least two students were very proficient in lip-reading as well as, it turns out, interpreting. The teacher would talk and these students would discretely “interpret” for the other students around them. Though I saw no augmentation devices, at one point the instructor turned out the lights and showed a video, (without captions) and then the teacher stood behind the students making spoken observations on the film. It is my opinion that [the teacher] is the most devoutly religious person I have ever encountered; spending each day talking to no one but ***self and trusting God to put knowledge in the students’ heads. (Written six times in a row under the words New Rule 2011. If it was feedback, that was the only feedback that poor mentee got) In the end that was the start of Rule 9. You get praise for doing more than expected. You don’t get praise for not screwing up. Not screwing up is expected. New Rule! TelePrompters are for looking at! Its likely the names you are struggling to spell are written right there on it!!! (With three exclamation points. I deserved it). I promise I’m a nice guy. Promise! 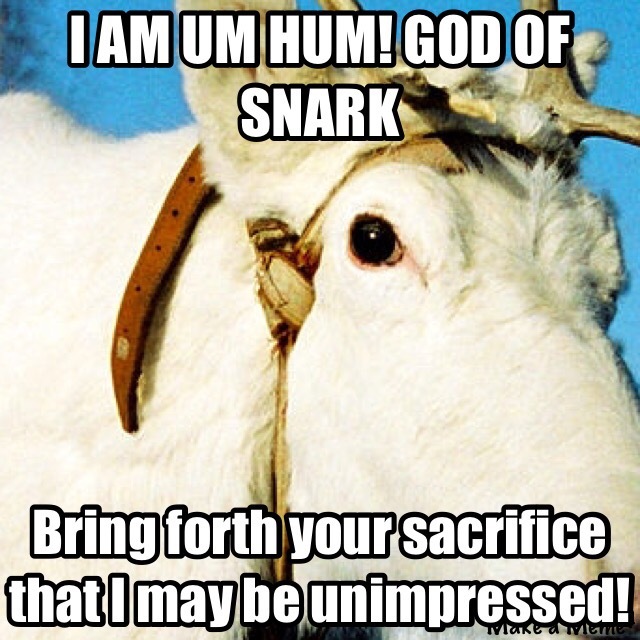 Right, Um Hum God of Snark? YES, AND IF ANYONE SAYS DIFFERENT HE WILL LITERALLY FIGHT YOU! 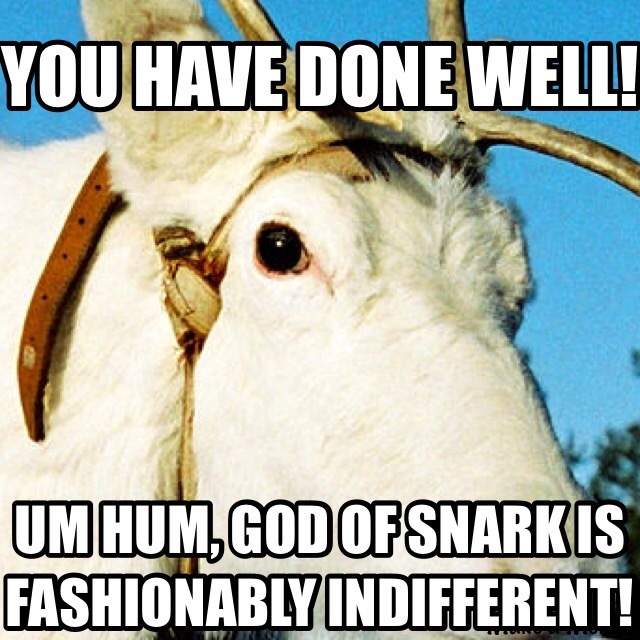 Yeah… thanks God of Snark.